A thin-knit layer... London in September is unpredictable. Statement gold earrings can instantly transform your look into something very high-fashion. J.JS Lee. For her futuristic display of primary colours. Day three (or day two, for me) was yet another whirlwind. We stopped by The Apartment in the morning for some breakfast and a little snoop before heading to the ROBERTS | WOOD presentation, followed by J.JS Lee which was amazing! Before grabbing something to eat Georgia and I headed back to The Apartment to monogram some gorgeous Aspinal clutches - see here! We then met a friend at Dean Street Townhouse for a late brunch before the Phoebe English presentation. On the Sunday I wanted to wear something really transitional as the weather was being SO unpredictable! 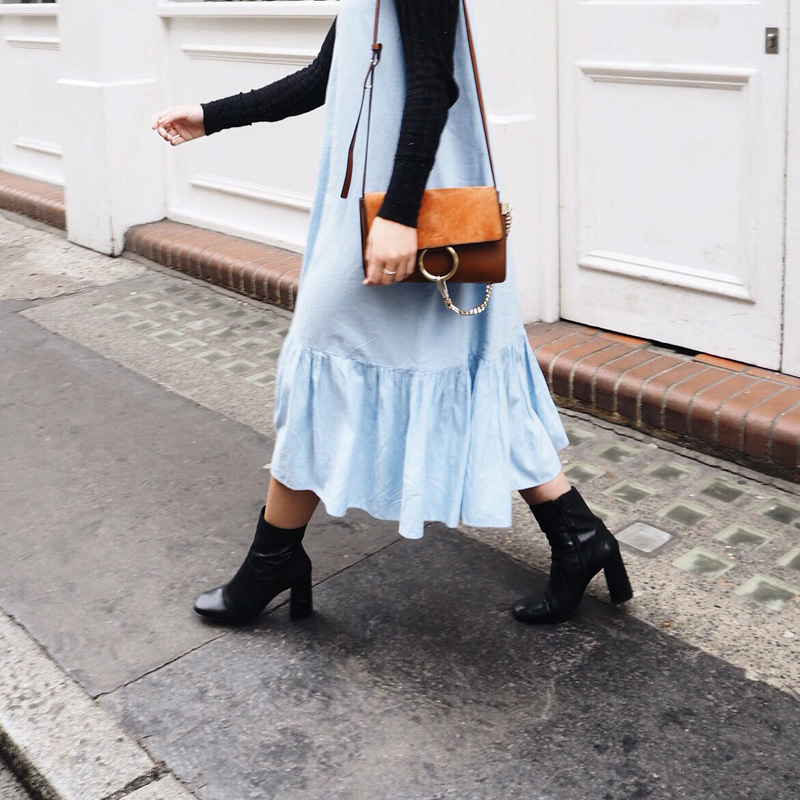 I paired my ribbed Whistles top with an oversized, boxy midi dress from Zara - the drop-hem/ruffle was very 'me' and I couldn't resist this piece when I saw it last week. I finished the look with a sleek low-pony, oversized gold earrings and my very trusty black sock-boots from Office.